Three Bristol Grammar School (BGS) rugby players are reflecting on a great season and hoping for bright futures in the game after earning selection into England Rugby age-group squads this season. Front rows, Will Capon and Tom Rowland, both represented England at U18 level in fixtures against other Six Nations U18 sides, and BGS teammate Charlie Powell was selected for the England U17 training group. Will’s England performances have earned him a place on the England U18 tour to South Africa this summer, while Charlie is hoping to follow in Tom and Will’s footsteps with selection to the U18 group next season. 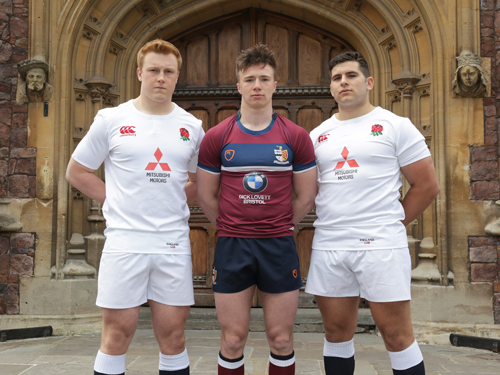 The trio all play First XV rugby for BGS, as well as being part of the Bristol Rugby Academy, and all aspire to reach a professional level of rugby. Tom, currently in his final year at BGS, has already been awarded a professional academy contract by Bristol and made an appearance for the Club’s First XV earlier this season.